This​ story​ was​ updated​ Aug.​ 11,​ 2017. The rise of high-deductible health plans is starting to cut into hospital admissions and threaten record hospital margins boosted by the Affordable Care Act. Patients avoiding elective surgeries and other procedures because of skyrocketing out-of-pocket costs were cited by hospital chains as a primary cause of softening hospital volumes in the second quarter. Giants HCA, Community Health Systems, Tenet Healthcare and LifePoint Health felt the sting of flat to lower admissions in the second quarter, causing earnings declines. They also all cut earnings guidance for the year. The few not-for-profit hospital systems that disclosed their results this week fared little better. 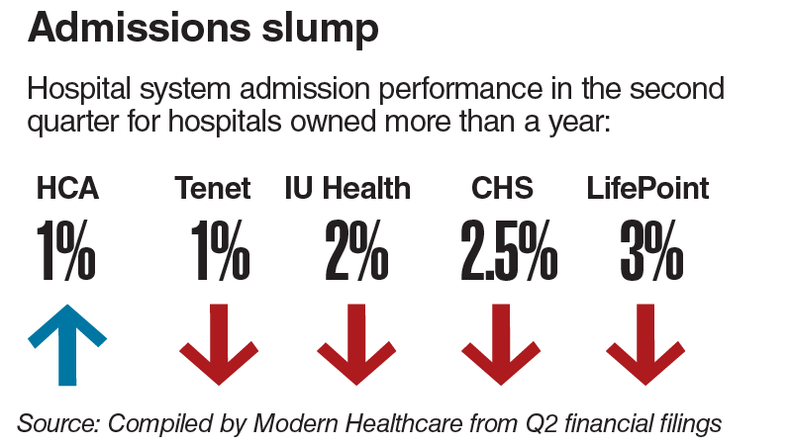 Fourteen-hospital Indiana University Health posted a 46% drop in operating income in the quarter on a year-over-year admissions decline of 2%. WellStar Health System of Marietta, Ga., saw flat admissions across its 11 hospitals for its fiscal year ended June 30, though six hospitals acquired a year ago drew down the average, said WellStar Hospital Division Chief Operating Officer Carrie Owen Plietz. That said, operating margins for the system's hospitals rose a notch to a respectable 4.7% from 4.6% the year earlier on strong cost controls and a higher-acuity case mix. "Times are still pretty good for hospitals but the writing is on the wall," said Paul Hughes-Cromwick, co-founder of the Altarum Institute's Center for Sustainable Health Spending in Ann Arbor, Mich.
Until about a year ago, hospital admissions were rising at about 3-4% annually, primed by more than 20 million newly insured under the ACA and Medicaid expansions in 32 states and the District of Columbia, analysts say. But that rate has slowed to 1-2% in recent months as the number of newly insured has flattened. And as evidenced by the rough second quarter experienced by hospital systems largely across the board, the "new normal" of 1-2% might be optimistic. Tenet President of Hospital Operations Eric Evans blamed the system's 1% decline in second-quarter admissions on high deductible plans, fewer births at Tenet hospitals and some lost business because Tenet was an out-of-network provider for Humana for part of the quarter. "In the last couple of years, deductibles in many cases have risen by as much as 30%, and that is changing how people access care, at least in the short run," Evans told analysts during Tenet's second-quarter earnings call Tuesday. Tenet is the nation's third-largest investor-owned hospital chain with 77 hospitals. Evans said volumes are holding up in the critical specialties, such as cardiology and neurology. 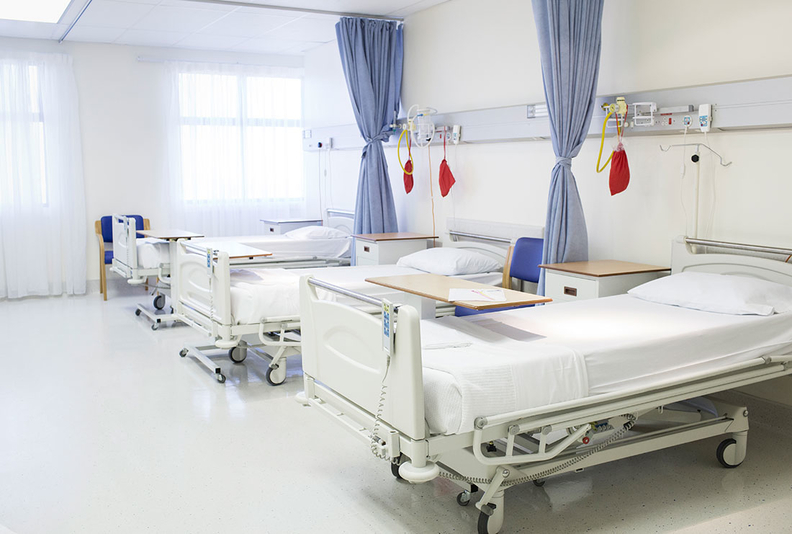 Those are areas that Tenet has been aggressively strengthening, including recently finishing four major hospital expansion projects in Detroit, San Antonio, Texas, El Paso, Texas, and Delray Beach, Fla. But fewer elective surgeries and procedures are dampening volumes, partially driven by consumers deciding whether they can afford them. "The more elective procedures, things like orthopedics, we see the softness. So, we think that does play into the story of deductibles rising and changing behaviors," Evans said. Hospital systems are combating high deductibles and the consumer price shopping that they contributed to by expanding ambulatory points and making sure they have hospital specialties to capture sicker patients. Dallas-based Tenet has 99 urgent care centers and 19 freestanding emergency departments in its major markets today compared with 52 and 15, respectively, in 2014. Moreover, the system is trying to leverage the $2 billion-plus majority acquisition of giant United Surgical Partners International in 2015 to offer more ambulatory surgery options in its hospital markets and grow that business outside those markets. While growing access points in markets where it has first or second hospital market share, Tenet, meantime, is divesting hospitals in markets that can't meet that lofty goal. This month Tenet completed the sale of three Houston hospitals to HCA, using the $750 million in proceeds to pay off loans used recently to increase Tenet's equity stake in USPI to 80%. WellStar took advantage of Tenet's divestiture strategy to buy the system's five Atlanta hospitals and establish a strong beachhead in that fast-growing market. WellStar is adding physicians in its Georgia markets and has built four comprehensive health parks around its hospitals to offer nearly every service short of inpatient care, including diagnostics, therapy and even healthy cooking classes, Owen Plietz said. WellStar is having success drawing in patients with daily or weekly healthcare specials, Owen Plietz said. For example, for a limited time, WellStar is offering coronary calcium scans for $99 for individuals or $149 for a couple. The tests are cash-only and not subject to insurance claims. WellStar also is offering walk-up mammograms at two of its health parks cleverly branded as "Think Pink Thursday" at one and "Walk In Wednesday" at the other. Employers are encouraging their workers to be better healthcare shoppers, said Suzanne Delbanco, executive director at Catalyst for Payment Reform. They are adjusting plan designs, for instance, to reduce employee out-of-pocket co-payments to a flat $30 if they get care in an urgent care center compared with a 20% co-payment for a much more expensive hospital emergency room visit. "There's just much better awareness of how much more expensive an acute-care setting is," Delbanco said. As consumers price shop at the behest of employers or to save on out-of-pocket costs, the trend threatens to eat into elevated hospital operating margins, Hughes-Cromwick said. Those margins are at historic highs, according to a March report to Congress by the Medicare Payment Advisory Comission. They have been on the rise since last decade's recession, reaching a record 6.4% average for all hospitals in 2015, the latest year for which Medpac has data. They troughed at 1.5% in 2008 and rose consistently to 5.6% in 2012 and 6% in each of 2013 and 2014. Hughes-Cromwick said hospitals got leaner in anticipation of the ACA's promise to move more reimbursement from fee-for-service to risk-based payment. Yet, volumes surged across the country from the 20 million-plus newly insured, he said. Those volumes have topped out today. And federal ACA reforms or repeal are likely to mean fewer, not more, insured, Hughes-Cromwick said. The ascendency of high-deductible insurance plans is making it just that much more difficult for hospitals to hold the margins they've come to enjoy, he said. In 2016, for the first time, more than half of all workers (51%) with single coverage faced a deductible of at least $1,000, according to a study released last September by the Kaiser Family Foundation/Health Research & Educational Trust. The study showed that 29% of workers were in high-deductible plans compared with 20% two years earlier. Hughes-Cromwick said the good times of ACA volume increases are over and a reckoning for hospitals is afoot. "A lot of the pent-up demand (for services) has been met and we're back to the secular issues confronting the industry, like hollowed-out insurance coverage," he said.